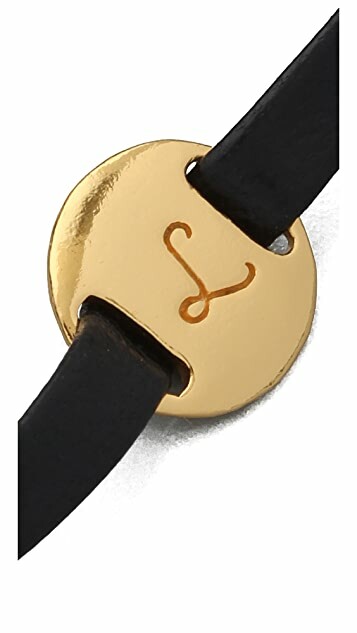 This leather bracelet features an embossed letter at the disc. 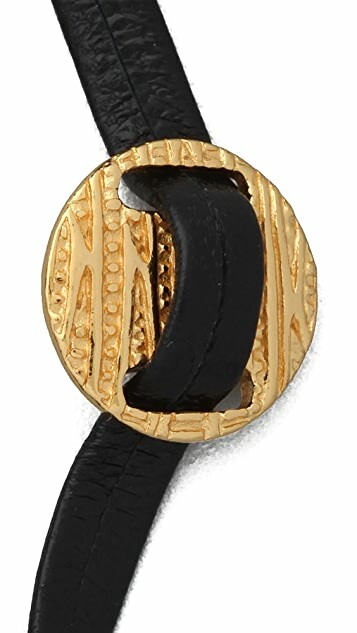 Ring-and-toggle clasp. 18k gold-plated hardware. * 6.5" (16.5 cm) long. I got this bracelet to stack with my bangles and cuffs as I find it too intricate for my taste to wear it on its own. It's a simple leather bracelet and I find the size perfect(since I have fairly small wrists). 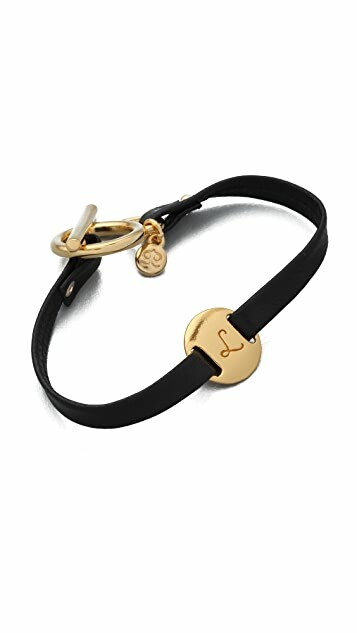 The leather strap is fairly thin so I do not foresee it being as durable as some of my other leather bracelets but it is not exactly flimsy either.Highly recommended for a gift to a girl friend as well ! It is super cute, however the gold pendant bit is actually not gold, it's made of some sort of squishy material. This is so cute, a absolutely love this, so simpe and cute. I never take this off. I love this bracelet and was hoping that although it wasa a bit small for me that it would stretch a bit since the strap is leather. It didn't stretch but it did break :( Size options on braceeltes like these where no extenders are available would be ideal. I got this for a friend for her birthday and she loved it. Simple yet personal. I absolutely love this piece! I wasn't really expecting anything stunning, but I got this really beautiful delicate bracelet. It's so unique and lends that little "extra" to an outfit. I'd buy another if they had it with my initial (I got one with my daughter's initial).